Important examples of Postmodern architecture in the UK are under threat, warns heritage campaign group the Twentieth Century Society, which is holding a conference this weekend to kickstart a wider movement to protect them. "We are not managing to get any Postmodern buildings listed and we're not doing very well at conserving even the very best examples," Twentieth Century Society director Catherine Croft told Dezeen. "We might lose a whole chapter of architectural history," she said. Prominent Postmodern buildings in London have recently been subjected to alterations that have significantly changed their facades, or have been demolished completely despite strong campaigns for their protection. 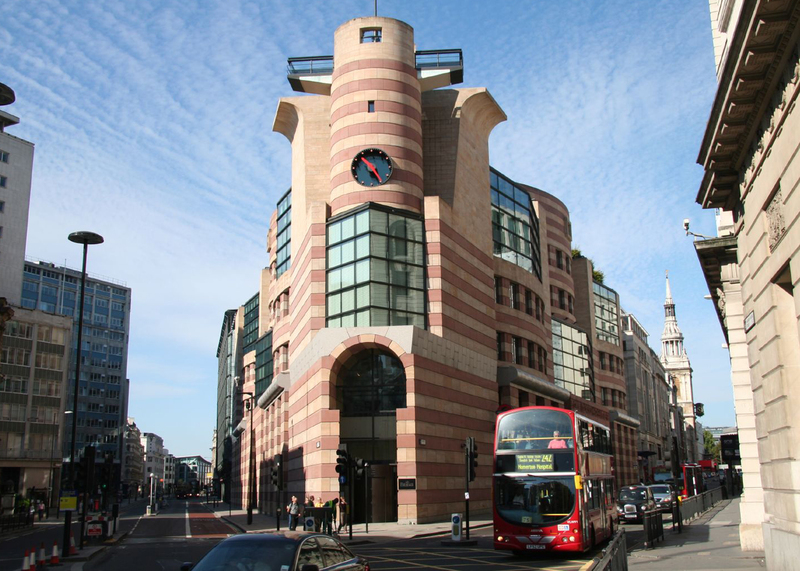 No 1 Poultry, the last completed building by architect James Stirling and a Postmodern icon, became the focus of a preservation battle last year involving some of the world's best-known architects after a series of proposals were put forward to alter its facade. Terry Farrell's equally iconic 1982 TV-am studios in Camden was stripped of its Postmodern details in later renovations. Parts of the 1980s Broadgate development by Arup Associates and Peter Foggo, were recently demolished to make way for a new office building by Ken Shuttleworth's firm Make. "A lot of the best Postmodern buildings are commercial buildings in areas like the City of London where there's enormous pressure for redevelopment," said Croft. "They're being knocked down at a point where they're at the extreme low ebb of their popularity." "The Terry Farrell bank on Fenchurch Street has been altered," she said. "We've lost part of Broadgate, we've lost Ian Pollard's amazing Homebase on Warwick Road, and Marco Polo House, which epitomises the most commercial side of Pomo architecture, was demolished." The organisation is currently fighting proposals to alter Terry Farrell's Comyn Ching Triangle building in Seven Dials, Covent Garden. "With a lot of these buildings, particularly the more commercial ones, their facades is what really matters," said Croft. "They aren't buildings that have very complicated interiors. If you cosmetically alter the facades you haven't got much left." Postmodernism, which began in the late 1970s, reaching fever pitch in the 1980s and early 1990s, is one of the most divisive architectural styles, championing ornamentation, contradiction and experimentation. The Twentieth Century Society campaigns for the preservation and protection of 20th-century-architecture across the UK, and helped save a number of key Modernist and Brutalist buildings when they were considered unfashionable and problematic. It is organising a one-day Postmodernism conference on Saturday 21 May 2016 from 10am to 5pm at the University of Westminster, and will publish a list of the top 10 examples that it believes should be protected by the government. The conference will bring together architectural historians and academics with some of Postmodernism's proponents, including architects Terry Farrell, Piers Gough, and Charles Holland, and critic Charles Jencks, with the aim of kickstarting a wider study of Postmodernism as a movement. Croft said that she hoped that there would be a trickle-down effect to the public if academics and critics began discussing Postmodernism more broadly. A recent revival of interest in Postmodern product and fashion design and associated offshoots, like Memphis, could be a sign that tastes might be starting to shift. But Croft warned that it might come too late for some of the most prominent examples of Postmodern architecture. "In terms of promoting Modernist architecture, once Ikea got going on producing Modernist-inspired furniture for a very broad sweep of the population, it became much less scary for ministers to list buildings because it became very much part of an accepted cultural norm," said Croft. "We're waiting for the cycle of taste to come round again, but by the time that people begin reappreciating Postmodernism there's a great chance that an awful lot of it will have gone."